So restless the English are, with the waves at their very door. Over the last year I have been testing the bounds of my Persepolis diaspora project, in which I chart the worldwide dissemination of broken stone taken from the Iranian ruins. I’ve been tidying the chronology of what I euphemistically (for now) call ‘fragmentation events’ at the site, following up lost objects and missing links. New pieces have turned up, some that need an explanation, some that do not: a lump of lintel in Philadelphia (needs an explanation), a delicate moulding with an eighteenth century label in Copenhagen (does not). I’ve raided new archives, and scheduled the most far-flung of my museum research itineraries (to India and Japan). Fold and splice together the buildings worldwide that contain Persepolis, Inception-style, and you may imagine pacing down one, long, multinational museum corridor. (While the political weather blows outside; there are howling draughts). At this stage, it’s rare that I find a signpost to an unknown fragment in print (rather than, say, a manuscript archive), or one that points to anywhere other than an institutional store-room. But here’s the story of a tiny piece that I came across close to hand, in more or less plain sight, in Kent. This one has no label, but was so surrounded by texts that it almost doesn’t need one. The stone is small, dark and blank, but for two lifetimes it was a physical link with a heightened moment, both national and personal, in the 1920s: the start of a new political era in Iran, and Vita Sackville-West’s travels there. Vita’s son, Nigel Nicolson, mentions the fragment in a description of his mother’s study in the restored Elizabethan tower at Sissinghurst (Nicolson 1992). Vita bought the ruined Tudor palace in the spring of 1930 as a substitute ‘ancestral’ estate in place of Knole, the childhood home that, as a daughter, she could not inherit. Knole had been, ’a private coral reef of accumulated riches,’ in the words of her grandson Adam (Nicolson 2009, 260). Vita must have picked up her souvenir at the Persian New Year in March 1927 en route south from Tehran, where her husband Harold Nicolson was serving as Chargé d’affaires. Her account of her first journey in 1925, A Passenger to Teheran, is well-known for its portrayal of the coronation of Reza Khan as Shah of Iran in the spring of 1926, following his military-led takeover of the country. Her 1927 publication Twelve Days, meanwhile, is a more impressionistic series of travel vignettes, the last two of which focus on the ruins of Persepolis and Palmyra, respectively. It turns out that Vita cannot resist alluding to the portability of fragments from the fissured column bases of the Hall of the Hundred Columns, which had been left exposed to weathering following an early attempt at excavation by the Governor of Shiraz in the late 1870s. [The] ruins…in their broken detail testify to the richness of the order that once was here: fallen capitals; fragments of carving small enough to go into a pocket, but whorled with the curls of an Assyrian beard; wars and dynasties roll their forgotten drums, as the fragment is balanced for a moment in the palm of the hand. The stone in her study is indeed the right size for both hand and pocket. 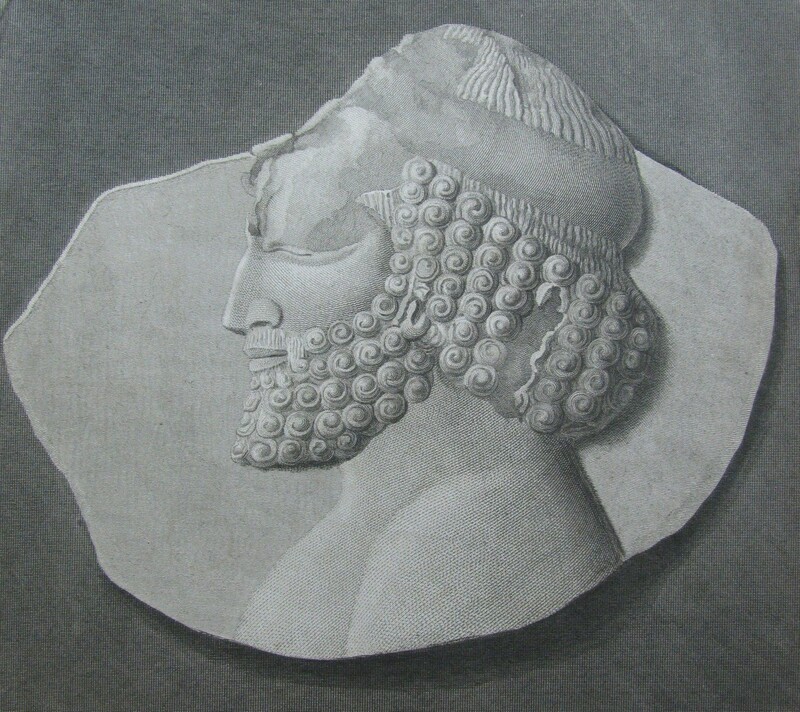 Sackville-West described Persepolis as ‘midway between the Bakhtiari country and the outposts of England’ at the oil fields of Abadan, locating it both literally and metaphorically between nomadic antiquity and Western modernisation, and the future of Persepolis itself was indeed hanging in the balance. With the grand (and inaccurate) claim that ‘the hand of man has never desecrated these ruins’, Vita presented Persepolis as a memorial, ‘a dead world… the sepulchre of an imperial race’. A survey panorama of the Persepolis terrace published by Ernst Herzfeld in 1929, discussing its potential for investigation and restoration. He reconstructed the ‘andarun’ or (imagined) private quarters, to the lower left as his dig house and the site museum. And still the strange meaningless conversations continue, and I wonder more and more at the fabric which nets the world together, so that anything which I do finally incubate out of my system into words will quite certainly be about solitude. Solitude and the desirability of it, if one is to achieve anything like continuity in life, is the one idea I find in the resounding vacancy which is my head. Ironically, she and Herzfeld seem to have been in search of more or less the same thing. The creation of living quarters in Persepolis, on the plan of an ancient palace, a place to accumulate both relics and books, began in early 1931. Despite drastic differences in setting, the personal drive for a historic home created in both cases a fluid heritage environment composed of landscape, ruins, a library and walled garden. Meanwhile, between Vita and Virginia, the stimulation of months-long exile and intense correspondence created a dialogue on loneliness and literary aspiration refracted through architecture and landscape. In a letter begun (as so many visitors’ letters were) at Persepolis, Vita wrote to Virginia on literary competition and shared themes, concluding: ‘Yes, let’s write about solitude.’ In her first picture of the site from across the plain, the site embodies both apartness and movement on a grand scale. Persepolis gains in splendour from its isolation… As a ship launching out on an expanse of sea, the great terrace drives forward on to the plain, breasting it, the columns rising like naked spars into the clear blue of the sky. In her first year there, Vita played with the thought of a visit from Virginia and Leonard, wishing that she could be, ‘faced with the task of communicating Persia’. How I wish I could bring you here.. No, of course you won’t: what, leave the press? I don’t believe Isfahan and Persepolis are any temptation to you. I wish life was three times as long, and every day of it 48 hours instead of 24. Orlando or Vita? Vita talking about travelling in Iran, in 1926. I visited Sissinghurst in November 2016, so that I could turn over a dark and anonymous fragment from the study windowsill in my hand, and confirm that it was what I suspected when I found a ‘slate’ moulding on the online database: the ‘stone from Persepolis’ described by Nicolson. In the gatehouse, there is an album of Harold and Vita journeying by mule and horse in the summer of 1927 on ‘the Bakhtiari Road’, but nothing of Persepolis, Shiraz or Tehran. Vita’s study still has cut squares of Persian carpet on floors and tables, and shelves full of a nineteenth-century English print reflections on Iran. It was a cold afternoon, and with the next morning came the first proper frost of the year. In this dense, limestone shard from Persepolis, time and space are compressed. While its origin was remembered in family memory, the stone stood for ‘the vast green plain, encircled by mountains and the open sky’, a crucible for those few years, between 1926 and 1931, of multiple identities in formation. This packing up and going off, exploring deserts and catching fevers, settling in India for a lifetime, penetrating even to China and then returning to lead a parochial life at Edmonton, tumbles and tosses upon the dusty floor like an uneasy sea, so restless the English are, with the waves at their very door. The waters of travel and adventure seem to break upon little islands of serious effort and lifelong industry stood in jagged column upon the floor.